Coconut Oil Fudge - Easy, Delicious, No Cooking Required! You are here: Home / Recipes / Coconut Oil Fudge – Easy, Delicious, No Cooking Required! Coconut Oil Fudge – Easy, Delicious, No Cooking Required! This coconut oil fudge recipe has no refined sugar (it's sweetened with honey or maple syrup) and is loaded with healthy coconut oil. (Yes, coconut oil is good for you!) You can mix it up in just a few minutes – without turning on the stove – and it's a great not-too-sweet treat to keep on hand in the fridge. Adapted from Tropical Traditions. Print Friendly version at bottom of post. In the bowl of a stand mixer (or other medium bowl) stir coconut oil until creamy with no lumps (if oil is too thick set bowl in warm water). You want the oil soft, not liquid. If it is liquid, the other ingredients will settle to the bottom of the pan instead of staying mixed with the oil. If you have separation, you can warm the whole thing and remix. Add cocoa powder and sweetener, mixing after each ingredient. Mix in the dried fruit, (coconut), and nuts. 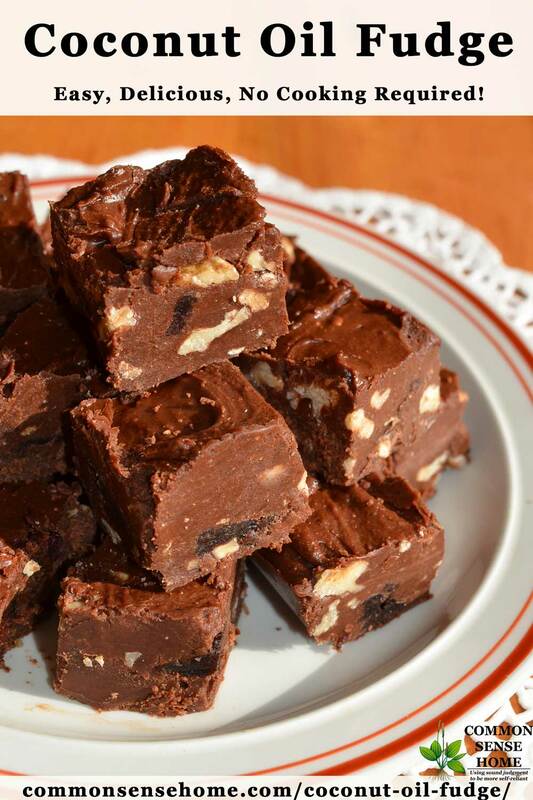 Spread fudge into 7″x11″ or 9 or 8 inch square pan and refrigerate or freeze until firm. Cut into squares and serve. Keep refrigerated. That's it! This makes a velvety smooth coconut oil fudge that melts in your mouth (and on your fingers – be warned – no candy coating). The melting point of coconut oil is around 75ºF, so this will melt very quickly in hot weather if it is left out too long. Let sit out for a few minutes at room temp to make it easier to slice. Use 1/2 cup dried cranberries, skipping the cherries and dried coconut. Sweeten with maple syrup. Note: Maple syrup tastes less sweet than honey, so if you prefer a sweeter treat, stick to the honey. This fudge is very rich, so a little goes a long way. If you like, you can easily cut the recipe in half and pour it into a glass loaf pan, or use the 8×8 pan but just have thinner pieces. Whatever you do, don't use refined coconut oil for this recipe! Eating refined coconut oil straight is like eating candle wax. I only use refined coconut oil for frying or greasing pans. Pins and Shares always much appreciated! 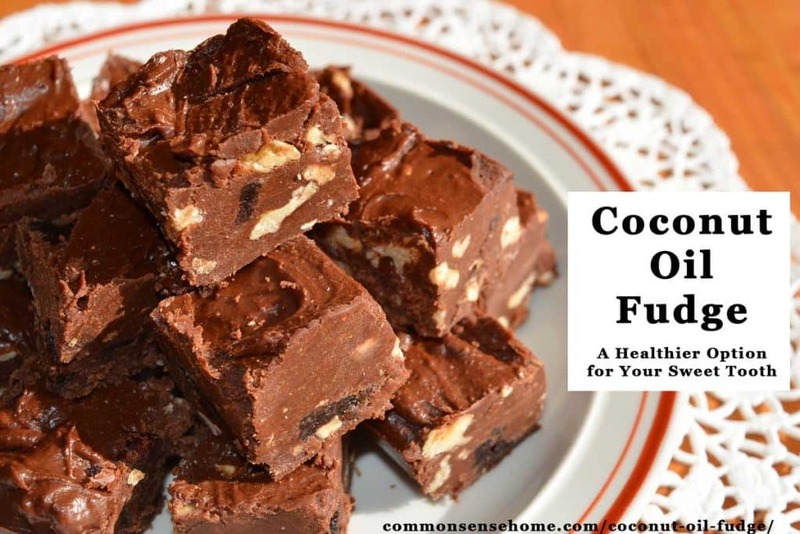 Easy coconut oil fudge recipe features coconut oil, nuts, cocoa powder, maple syrup or honey plus dried fruit. Loaded with healthy fat and antioxidants. I only use refined coconut oil for frying or greasing pans. Originally published in 2011, updated in 2014, 2016, 2018. This is great Laurie! I will have my daughter help me make this on Saturday. This is a yummy treat that can be used as our Saturday treat..I will share this tomorrow on the health corner fb page..Thanks for sharing.. Thanks, Jo. It keeps well in the fridge,too, which is nice, because a little goes a long way. It's very rich. Yumm…will be trying this.. I have a peanut butter fudge that I LOVE too!! Thanks! I found you through Fight Back Friday – this is great. I liked your suggestion about keeping the oil soft but not melted so the mix-ins stay suspended. Thank you for the tips! Cant wait to try it! And I am looking for the book at my local library right now! Thank you! "Eat Fat, Lose Fat" is a good place to start losing your fear of fats. I just finished reading "Deep Nutrition: Why Your Body Needs Traditional Foods" and love, love, loved it! I'm thinking of doing a giveaway on that one, just to get the word out about it. Kelly – I use coconut oil on my hair and skin, too. I like it so much, I buy several gallons at a time. 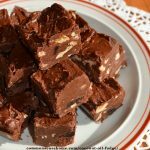 What a delicious and much healthier fudge recipe. I am going to have to add a category to my candy round up and include your recipe! Thanks for sharing this recipe with the Hearth and Soul Hop. Thanks, Alea! Looking forward to your posts. Hi. Recipe sounds delish! Where can we buy the coconut oil n bulk? I usually buy mine through UNFI or directly from Nutiva or Tropical Traditions. Nutiva ships their gallon containers free. Just a heads up: I started buying my 74 oz of coconut oil at Costco at only $21.00 and some change. Best price in my town anyway. I used to get 54 oz from the Vitamin Shoppe and that was around $26.00 so Costco a lot less cost and a much larger container. It is the Nutiva brand too. I hope you enjoy it, Tami. I’m thinking half a batch. Can you believe I’m the only one in my family who likes fudge of any kind? Other books about coconut oil that I’ve found helpful are “The Coconut Oil Miracle” by Bruce Fife, “Good Fat” by Fran McCullough, and “Saturated Fats May Save Your Life”, also by Bruce Fife. Yum, I repinned you. Can I share this on my podcast? Gross, gross, gross. Thank goodness I only made half a batch of this. What kind of coconut did you use? If you use refined coconut oil, it would probably taste like chocolate flavored mildly sweetened candle wax. I only use Nutiva on this recipe, which has a rich, fresh coconut flavor. Everyone that’s tried it has raved about it, even my husband who is normally not a big coconut fan. Another thought I had overnight was whether or not your coconut oil and honey may have separated. You don’t want the coconut oil too hot, or it will want to float on top of the honey instead of remaining blended. Mixing the honey and the cocoa first, and making sure the coconut oil is *just* soft enough to blend – not liquid – will help to yield the correct texture. Quick question…I live in sunny South Florida. My kitchen is hot this time of the year and my coconut oil is completely melted. Should I stick it in the fridge before making this recipe? Yes. If the coconut is completely liquid, the solids settle out during mixing. Just let it set up enough so it’s still easy to mix. Can I use any kind of maple syrup… (I have Pecan flavored) I also have honey but not a huge fan of honey.. Thanks! I think any sort of natural liquid sweetener would work just fine. I am looking forward to trying this. I love coconut oil. Thanks for sharing. I hope you like it. We really enjoy it. COULD I ADD unflavored gelatin (for joints) or chia seeds to the mix to make eating in FLorida summer? You can add anything you like. What the texture would be like when you’re done, I’m not sure. Gelatin is typically used to stiffen liquids, not fats, so I don’t think it’ll firm up the fudge very well. Storing the fudge in the freezer will buy more time at room temperature for serving.